Re-affirming his loyalty, Senate President, Bukola Saraki on Wednesday distanced himself from rumours linking him with a plot by some prominent politicians to form a new political party ahead of the 2019 general elections. Pitching his tent with APC, Saraki said he currently enjoys a robust and cordial relationship with President Muhammadu Buhari and the leadership of the party. The Senate president made the declaration in a chat with his special adviser on media, Yusuph Olaniyonu by Daily Independent. Yusuph Olaniyonu was equivocal in saying that those spreading the rumour are the ones who have been plotting the downfall of Saraki since the day he emerged the president of the Senate. He debunked the story as rumour, while wondering why Saraki who did not think of dumping the APC when he was battling for political survival over alleged false declaration of assets will contemplate doing so now. “It is a stupid claim by some unscrupulous elements to link the Senate President, Dr. Abubakar Bukola Saraki with the plot to form a new political party. He has pledged his allegiance to the ruling party, the All Progressives Congress (APC) and nothing is going to change that”. “Just look at the cordial and perfect relationship between the President of the Federal Republic and the Senate President in recent times. Even when he had problem and had to appeared before the tribunal, it never crossed his mind to dump the APC and align with other political parties not to talk of forming a new one”. “As we speak, those opposing the Senate president can no longer enter Aso Rock today but he goes there everyday. Cast your mind back on the birthday of Mr. President, how many of the accusers of the Senate president were around? Only the Senate president was there. Even on Christmas day, the senate president was there”. “So, the talk of the Senate president ganging up with some faceless people to form a new political party is nonsense”. “Those who have problem with the president or the party should go and sort it out themselves. 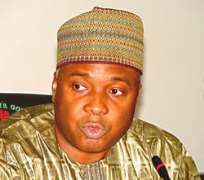 The senate president does not have any problem either with the president or the leadership of the party” he said.